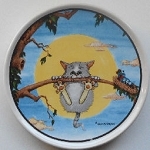 We purchased these cat pet medals at the manufacturer's sample sale. 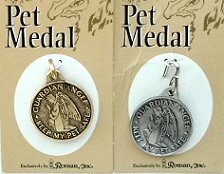 The pet medal features an angel on the front and the words Guardian Angel Keep My Pet Safe. The back of the medal has room for the pet's name and a contact phone no. (vet's phone no. recommended). Each medal is 1 1/16" in diameter. 2 silver tone medals left.